Aaron Jones is known as WVJC – Bridgeport’s jack-of-all-trades. Aaron has an associate degree in Information Technology, Business Management and Executive Office Technology. He also holds a Bachelor of Science in Information Technology. He has a great deal of previous work experience that pertains to his love for technology. Aaron has worked as a Dell, Sony, IBM and Lenovo Technician for Worldwide Tech Services. Some of you may have even heard him on the radio at WV Radio Corporation where he worked an IT position in the engineering department. Aaron finds his motivation from his family and from the success of his graduates. Every day he strives to do his very best and looks forward to continually helping the students of WVJC. Aaron’s idea of a perfect day is being at home with his wife and little boy, but as his coworker, I know he also enjoys dressing up for comic-con. 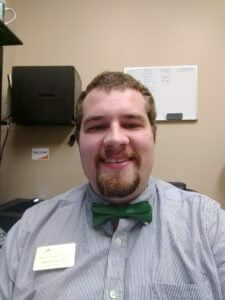 He said, “Being able to raise and support my beautiful family, and using the gifts I have been blessed with to provide knowledge and wisdom to future generations of the IT field is an incredible feeling.” Aaron hopes to continue to stay up to date with advancements in technology and hopes to always deliver the best and latest education to future generations.